How long should the survivors of the Bhopal gas leak wait for a ‘just’ compensation? Twenty-seven years after the tragedy, there is still no clear answer. Twenty-seven years after the world’s worst industrial tragedy, one which officially took a toll of over 15 thousand people, the aftershocks are still not over. While activists are opposing Dow Chemical’s sponsorship of the ‘Greenest ever Olympic Games’ in London next year, the company has refused to subject itself to the jurisdiction of the Supreme Court of India; and it is becoming increasingly doubtful if international law will ever be able to force the multinational to accept any liability for what happened in Bhopal in December, 1984. With the winter chill finally settling in, Delhi is well and truly into its winter cultural season. Centre stage is naturally occupied by events to celebrate the centenary of the Delhi Durbar to mark the shift of the capital from Calcutta to Delhi, held a hundred years ago on December 12, 1911. The new city was named New Delhi, to distinguish it from Old Delhi or the erstwhile imperial seat in the Mughal city of Shahjahanabad. The great Urdu poet Faiz Ahmed Faiz (1911-1984), born in Sialkot, educated in Lahore and who taught briefly in Amritsar, resigned from the Army to work as a journalist. The people’s poet, and an avowed Marxist and accused of being an ‘atheist’ in Pakistan, he spent several years in prison. He has bagged seven National Film Awards for the best singer in the film industry, a record no singer has matched so far. In 2006, he sang 16 film songs in four South Indian languages on the same day. Kattassery Joseph Yesudas, better known as K. J. Yesudas, or Dasettan to his friends and admirers, has become a legend in his life time. That does not mean Dow will get away easily. Activists all over the world have spared no effort, and lost no opportunity, to highlight Dow’s involvement and to embarrass the corporation. The ‘Yes Men’ hoax of 2004 on BBC was one such attempt. Jacques Servin and Igor Vamos, on the occasion of the 20th anniversary of the Bhopal gas tragedy, pulled off a staggering hoax on the BBC. Posing as Dow representatives, they went on live television for six minutes and accepted full responsibility for the Bhopal tragedy. Before BBC discovered the hoax, Dow stocks took a nose dive, losing $12 million in half an hour. As the Games come nearer, more bizarre and possibly audacious attempts can be expected to force Dow Chemical on the backfoot. But while the focus is still on Dow, the role of the Indian Government can scarcely be ignored. Simple arithmetic shows that the GoI erred in arriving at a court-monitored settlement in 1989 with Union Carbide Corporation (UCC) and Union Carbide India Ltd (UCIL) on the basis of flawed data. While the government based the settlement on the figure of 3,000 deaths, the court settled claims for 15,274 deaths, leading to substantial reduction in the amount of compensation received by the families, who were mostly poor and had lost their bread winners. What is more, the Supreme Court of India, while settling the claim, had clearly stated that the "shortfall, if any" would be met by the Government of India. Now that the GoI is asking for an additional Rs 7,771 crore by way of compensation and resettlement, the question uppermost is how long the Government would drag the case and wait for a court verdict. A simpler option, and a just one perhaps, would be for the Government to shell out the money and recover it later, if possible, through litigation. There are, on this day, at least 6 cases pending in various courts of the country and one in the US court. The oldest one, pending in the Supreme Court of India since 1998, is a medical petition by Bhopal Gas Peedit Mahila Udyog Sangathan. It raises issues like the indifferent attitude of the doctors and hospital managements towards the victims, lack of proper treatment and non availability of required medicine. The second petition, filed on March 17, 2010, demands five times higher compensation. The third and the most important one is the curative petition filed by the government of India in civil matter of 1989 settlement for $ 470 million. It demands an additional sum of Rs. 5786 crore on compensation account, Rs 1670 crore for rehabilitation and Rs 315 crore more for the clearing of the chemical contamination left behind by the Union Carbide. This petition is crucial for several reasons. The apex court, at the time of the 1989 settlement between UCC and the GOI, had made it amply clear that any shortfall in the compensation amount beyond $470 million, would be made good by the Government. The Government first evolved a formula and paid lower compensation to the victims in a bid to avoid shelling out money. When the settlement was challenged by activist groups, the government changed its stance and supported the demand for higher compensation from UCC. This change of stance did not please the court. There undoubtedly have been a large number of fake claimants and many of them managed to receive the amounts too, thanks to large scale corruption in the claim courts deciding the cases. However, the consensus in Bhopal is that there was no manipulation with death claims. Indeed, the actual death figure is deemed to be even higher than 15,274 case accepted by the courts. The city of Bhopal, known as a city of lakes, has actually turned into a city of hospitals. According to a calculation, the city today has hospital beds far beyond the ideal per capita figure recommended by the World Health Organisation. It is ironic because few or none of the doctors over here have any clue to the treatment of victims, since the secret antidote for the leaked MIC gas was never revealed by the Union Carbide Corporation. 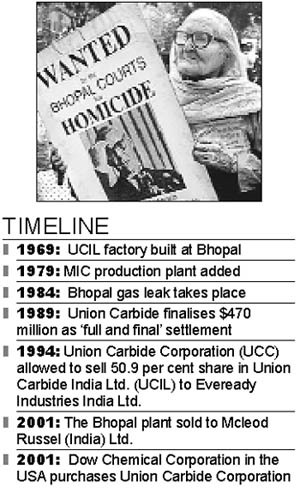 In 1989 Union Carbide was allowed to go scot free of all the Bhopal liabilities, including the criminal charges, by a mere payment of $470 million. When the sum was calculated for distribution among the claimants, nearly 95 percent of the claimants could receive only Rs. 25,000 each. However, thanks to the intervention of public spirited individuals and NGOs working for the victims, the criminal case was restored in 1991 but allowed the seemingly unjust civil settlement of $470 million. The Government of the day is blamed for a series of strategic mistakes or deliberate mischief. 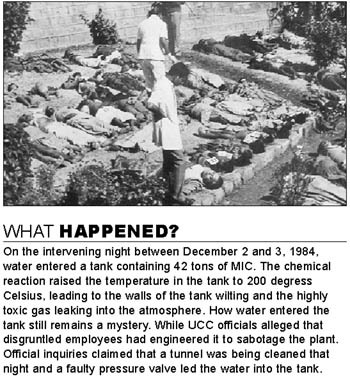 First, it was the release of the UCC chairman Warren Anderson, arrested in Bhopal on December 7, 1984. The decision to release him is said to have been taken at the highest level in the government. Anderson never returned to face trial in India and the Government never made any serious effort to bring him back, even when the Bhopal court declared him an absconder from the law in 1992. Then it was the dilution of charges against Carbide officials from section 304 of IPC (Culpable homicide not amounting to murder and carrying a maximum punishment of 10 years imprisonment) to section 304A by the Supreme Court in 1996. Section 304 A is generally applied to motor accident cases and carries a maximum sentence of two years imprisonment. Last year the Chief Judicial Magistrate sentenced several officials to imprisonment for just two years after holding them guilty of ‘killing’ 25,000 innocent people in 1984. Ironically again, survivors, who have been demanding their rightful compensation and justice, over the past 27 years have frequently been booked by the police under several sections of the Indian Penal Code, some carrying a jail term of 15 years. There was a glimmer of hope in June 2010, when the entire nation stood up in support of the Bhopal victims after the Bhopal district court pronounced just two years imprisonment for the Union Carbide India Limited officials and promptly released them on bail. The then Law Minister, M.Veerappa Moily, had to acknowledge the fact that the verdict was nothing but an example of ‘justice buried'. ‘This is one such case where justice is delayed and practically denied. I would like to say justice is buried', he said. 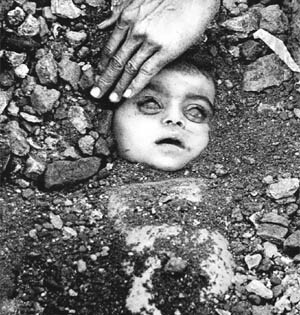 The curative petition was filed with a view to reopen the entire Bhopal case, which included a fresh look into the issue of infamous 1989 settlement with Union Carbide for $470 million and reframing of criminal charges against the UCC chairman Warren Anderson and the rest of the Indian officials. The apex court advised the CBI to take its case once again to the trial court. That is to say - back to square one. With all these disillusionments and diminishing hope for justice, on the 27th anniversary of the tragedy this year, the survivors chose to play a little tough. The annual ritual of peaceful torch light processions, some sloganeering and burning of effigies of those responsible for the condition they are in today, was abandoned. Instead, they chose railway tracks over the streets to implement their pre-declared Rail Roko agitation to press their demands. This resulted into violent clashes between the police and the demonstrators. Police fired in the air, lobbed tear gas shells and baton charged people as protesters pelted stones at the police and burnt a few vehicles. It was after a gap of nearly 22 years that the police and the survivors had clashed. There were just two earlier instances; First, it was on June25,1985, when dozens of gas victims were injured in a police lathi charge while attempting to reach the state Mantralay and again on August 9, 1989, when a demonstration was being held at the R&D centre of Union Carbide. 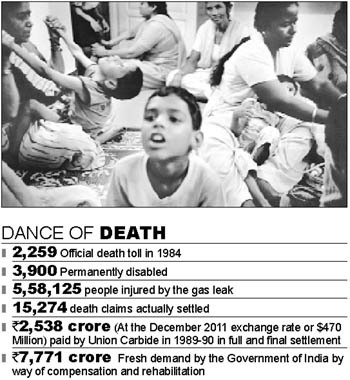 Survivors’ organisations had demanded that; a) the Government of India seeks adequate compensation from the American multinational Union Carbide and its new owner The Dow Chemical Company in the curative petition that is currently pending before the Supreme Court of India; b)In order to seek adequate compensation from the American corporations the Government of India must revise the figures of deaths and extent of injuries caused by the disaster. Another issue, which has been haunting the survivors of the Bhopal is that of the chemical giant Dow Chemicals. Bhopal survivors’ groups have been running a campaign ‘Dow shalt assume liabilities’ since 1999, when a merger between the Dow and Union Carbide Corporation took place. Dow has been refusing to accept any responsibility under the pretext that it was not responsible for whatever happened in Bhopal. The issue becomes all the more important since the toxic waste left behind are yet to be cleared. With Dow refusing to take any responsibility, the issue of cleaning the site becomes a serious issue, since no one in the country has the expertise to handle this highly sensitive and scary affair. Toxic remains in the Carbide plant have seeped deep into the ground and have contaminated drinking water of the communities in the vicinity. By the time the groundwater contamination was detected, hundreds of people had developed several ailments. It is causing havoc for children of the gas affected families in the area. The open areas, being used by the children as play ground, are severely contaminated by these very materials converting them into toxic play grounds. However children, even at the risk of their health, continue to play on these toxic grounds since they they don’t have any other place to play. These children, obviously, have no clue about the London Olympics, which are being sponsored by Dow Chemicals on ‘green grounds’ leaving the ‘toxic grounds’ in Bhopal. The river Yamuna is now resembles a sewer around Delhi. Predictable debates were held for months, on where the grand celebrations ought to be held and what they should be all about. Even more predictably, everyone had a different point of view. Some neo-imperialists felt the honour should go to the original site of the Durbar, Coronation Park, which is now a forgotten and rather forlorn piece of land and where the statues of the erstwhile rulers lie in a dusty pile. Some nationalists opposed this proto-colonial suggestion and wanted the Red Fort and a ‘Bharat mata ki jai’ kind of event. Meanwhile, like the proverbial cat that ran away with the piece of roti two crows were fighting over, Anna Hazare decided to register another note into this cacophony. His timing, impeccable as always, distracted attention on the eve of the centenary by introducing the birth of a newer Delhi at Jantar Mantar, and sealed it with a holy fast and fervent crowds. Guess where all the media attention was directed? These are the times we live in: an age where the best and the worst can exist in happy discord. When it became obvious that no one wanted another controversy over where and how, some went ahead with their business as usual. So the Delhi Tourism Department set up a Street Food Festival in the Connaught Circle area, where the famous street food of Old Delhi is available. How this celebrates the founding of New Delhi is a moot question but as there is no surer path to winning crowds than good food, this is presumably a sort of hors d’oevre to the real broth, which is still being stirred by many cooks. Meanwhile, the Delhi Government and Roli Publishers got together and brought out a fine publication, titled Delhi: Red Fort to Raisina, and edited by JP Losty, with contributions by Salman Khurshid, Ratish Nanda and Malvika Singh. The four essays paint a lively portrait of the culture and people to present a chronicle of the shift from one imperial age to another. The book has my vote as the perfect way of celebrating the city’s centenary. Ratish Nanda is a reputed conservation-architect who works with the Aga Khan Foundation and has been the guiding hand behind the renovation and conservation work in Humayun’s Tomb and the urban revival project of Nizamuddin basti; Salman Khurshid is a suave Muslim voice and Malvika Singh is the city’s best known hostess, whose salon would shame Ottoline Morrell or Gertrude Stein. Between them, they paint as lively a picture of New Delhi as you can wish. What this book offers are also some of the most exquisite illustrations one has seen of this grand city. Sourced from all over the world (the British Library, the Bibliotheque Nationale de France; the V&A Museum, among others), these paintings, photographs and rare maps are a collector’s dream. An exhibition to celebrate this book and its contents is now on view at the Indira Gandhi National Centre for the Arts (IGNCA). The coming months will, one hopes, build on other ideas to celebrate the city’s spirit. Its residents are,however, spoilt for choice. Virtually no week passes without some art exhibition, book launch or discussion, musical recital or dance performance on offer. Often the venues are so magical that the ambience alone is worth soaking in. The Qutb area, the grand ruins of Purana Qila, the tranquil serenity of Nehru Park - these are the sites of festivals that regularly present the country’s finest talent. Yet they all pale before the milling crowds at the annual Trade Fair in Pragati Maidan, when almost the whole city seems to descend in a frenzy of buying and gawking at new products. There is such a lack of imagination about sarkari celebrations that it would be nice to do it differently. How about reviving the riverfront of New Delhi? 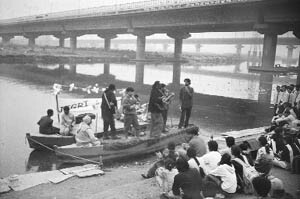 Would it not be wonderful if the Yamuna, once a river and now a sewer, can once again be made the thread of blue water that glistened on Delhi’s shores? The self-esteem of a capital would be restored and a sense of pride will surely emerge to inspire more community effort. A citizens’ campaign to revive this river could be the best way to bring disparate social groups together. Moreover, the lethargy of the government’s efforts would be exposed if New Delhi’s residents took this up as a challenge. It would make citizens feel that this is their city, and that if we wish to improve it, we have to stop waiting for someone else to do something about it. Remember what they did for the Commonwealth Games? If only Anna would stop chastising politicians and teach us how to make a model capital city out of an urban mess, I can vouch that all of us nay-sayers would join him with triumphant brooms in our hands. One of his daughters, Salima Hashmi, was in Jammu earlier this month to take part in one of the several functions in India to mark the Faiz centenary. How difficult is it to be the daughter of Faiz Ahmed Faiz ? My identity is undoubtedly because of my father. The love and blessings of people which he earned during his life is our heritage and inspiration. We have not seen the adulation and reverence waning over the years. Is there any particular memory that you cherish ? My father was in Hyderabad jail when I wrote him a letter on the eve of my ninth birthday and demanded a silk dress. On my birthday I did receive a brown coloured parcel containing a beautiful salwar-kameez and a dupatta with beautiful embroidery work. My father once invited me and my sister, Muniza to Montgomery jail. He showed us a garden he had cultivated. In the jail he showed us the cells and told us with a sense of pride that Moti Lal Nehru and Badshah Khan also stayed there. Last year I went to the same jail and saw that the cell in which my Abba stayed has been named after him. There was a board at the entrance that read ‘Kamra-e Faiz’. The garden is still there and the roses were in full bloom even in summer. All of you must have suffered a lot due to his frequent spells in prison ? His activism and consequences would certainly disturb us when we were children because my sister, Muniza and I were like other children. My father was in jail when he wrote Dast-e-Saba. We held a book release function, where I was surprised to see even elderly people crying while reading the book. I was still a child and believed that my father was a magician, who created magic with words. I do remember that whenever he would write a new poem in jail and sent it out, it would invariably make news. Did any of you in the family ever regret his activism? Iss rah mein jo sab pe guzarti hai, wo hum pe bhi guzri (Our suffering was no different than the suffering of others who chose the same path.) He chose to live with certain principles and did not mind paying the price. Who are we to complain ? How did he react to the treatment he received from military regimes ? While poets usually complain that people are indifferent to them, his experience was different. He would say that people of his country, and friends outside the country, showered so much love and affection on him that he felt humbled and found it difficult to reciprocate in equal measure. In 1984, at a railway station, an enthusiastic youth approached him and said that he was ashamed that Pakistan had made him suffer so much while he was respected all over the world. My father interrupted the young man and told him that he was confusing the government with the country. He firmly added that he received more love from his country than he deserved. Does loneliness facilitate creativity and did spells of imprisonment help the poet? It’s only when we are alone and left to ourselves that we start comprehending concepts of friendship, justice and cruelty. Solitude was no less than a blessing to my father. Whatever happened, it eventually happened for the good! How do you recall your father’s work? Many, who were condemned to death for demanding democratic rights during the military regime of Zia ul Haq, went to the gallows reciting his poems. My father took to poetry as he was very hesitant in expressing his feelings. He would remain silent most of the time. But whenever he bared his heart, he expressed the pain of millions in poetry. His poetry dealt with angst and revolt. In 1965, he sang a Russian song over Radio Kazakhstan. In 2001, he sang for the Album Ahimsa in Sanskrit, Latin and English. In his concerts in the Middle-East, he sang Arabic songs in the Carnatic style. He was a cultural ambassador of India. Selected for this year’s Swaralaya-Devarajan Master award for his contributions to Indian music, Yesudas sings Indian classical, devotional, and popular music. He has recorded more than 50,000 songs in several languages including Malayalam, Tamil, Hindi, Kannada, Telugu, Bangla, Gujarati, Oriya, Marathi, Punjabi, Sanskrit, Russian and English during a career spanning five decades. The award, instituted in the memory of music director G. Devarajan, carries a cash prize of Rs.50,000 and a plaque. Yesudas’s room is tastefully decorated with portraits of legendary personalities like Saint Tyagaraja and Semmangudi Srinivasa Iyer. An old gramophone record and beautiful wood carvings accentuate the effect. Amidst this music- filled ambience is another painting that sits pretty on the wall. Usually dressed in his trademark sparkling white dhoti and kurta, the veteran singer, asked about his first Indipop album, “Sitaron Mein Tu Hi", says “The people in Mumbai wanted me to sing for them. But somehow I never found the time till “Sitaron..." happened. I agreed, but made a request... the numbers must be of the kind that I normally sing... soft and simple. I must add that I liked the numbers." The ten melodies that blend pop and folk, were recorded in three days. But isn’t the line of demarcation between Hindi film songs and Indipop numbers very thin? “Nowadays, everything is connected with film music, even ghazals. We don’t listen to the kind of ghazals that Bade Ghulam Ali or Begum Akhtar sang," says Yesudas, whose personal favourites include golden oldies of Rafi and Talat Mahmood. He bemoans the fall in standard of lyrics. “May be it is written with the public in mind, to make it easier for them! Of course, nobody can be blamed for it. It is just that tastes are changing”, he says.